For pineal tumors presenting with hydrocephalus, simultaneous endoscopic third ventriculostomy (ETV) and tumor biopsy is commonly used as the initial step in management. To analyze the restriction which the foramen of Monro poses to this procedure, one must start with a detailed description of the microsurgical anatomy of the foramen in living subjects. However, the orientation and shape of the foramen of Monro make this description difficult with conventional imaging techniques. Virtual reality technology was applied on MRIs on living subject without hydrocephalus, as well as patients with hydrocephalus, to generate precise anatomical models with sub-millimeter accuracy. The morphometry of the foramen of Monro was studied in each group. In addition, displacement of the margins of the foramen was studied in detail for simultaneous ETV and pineal tumor biopsy through a single burr hole. In 30 normal subjects, the foramen of Monro had oval-shaped openings averaging 5.23 mm2. 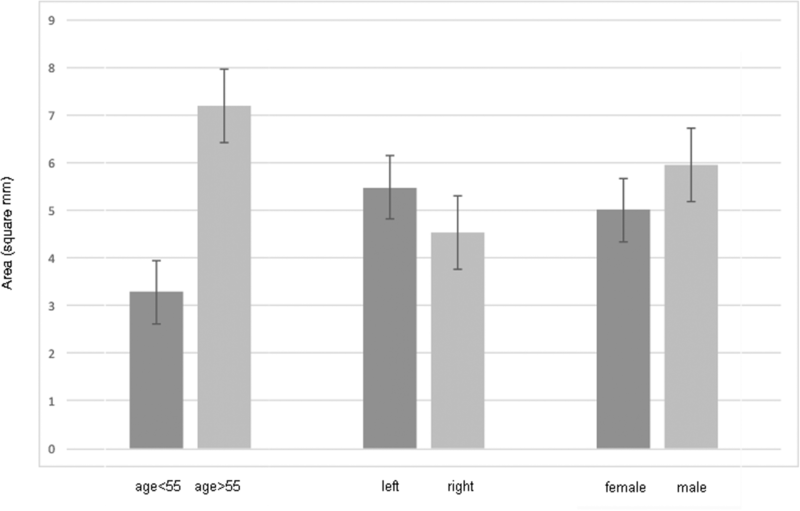 The foramen was larger in people above age 55 (p = 0.007) and on the left side compared to the right (p = 0.002). For patients with clinical presentation of hydrocephalus, the average opening was 32.6 mm2. Simulated single burr hole simultaneous ETV and pineal tumor biopsy was performed in 10 specimens. Average displacement of the posterior and anterior margins of the foramen was 5.71 mm and 5.76 mm, respectively. However, maximum displacement reached 9.3 mm posteriorly and 10 mm anteriorly. The foramen of Monro is an oval-shaped cylinder that changes in size and orientation in the hydrocephalic patient. If universally applied to all patients regardless of foramen and tumor size, ETV/biopsy can displace structures around the Foramen of Monro up to 1 cm, which can potentially lead to neurological damage. Careful pre-operative assessment is critical to determine if a single burr hole approach is safe. The contemporary management of pineal tumors frequently requires a biopsy as a first step [1, 2, 6, 7, 9]. Since hydrocephalus is frequently present as a consequence of the tumor compressing the cerebral aqueduct, many surgeons have advocated creation of an endoscopic third ventriculostomy (ETV) simultaneous to the biopsy. Though few would protest this course of action, disagreement exists whether to perform the two procedures, ETV and pineal tumor biopsy, through a single versus separate entry sites [1, 4, 8]. Since both procedures must necessarily traverse the foramen of Monro (FoM), and this being the narrowest channel which can affect the trajectory of both procedures, it is natural to focus here to answer the heated question. But while laying the groundwork to such a study, searching through the literature as a prelude to detailed anatomic investigation on the foramen of Monro, we came across surprisingly scant data on the morphology, orientation, or dimension of the foramen. There are several possible explanations for this lack of information. First, the channel of cerebrospinal fluid that constitutes the foramen of Monro does not exist in the axial, sagittal, or coronal plane. Accustomed to describing anatomy on modern MRI and CT scans, contemporary anatomists may have trouble defining the foramen on radiographic studies. Second, as a fluid-filled structure in life, and an empty space post-mortem, a detailed description of the foramen may require casting of the ventricles, once a popular way to study anatomy in the early part of the twentieth century, but is now a lost art seldom employed . An emerging alternative for studying human anatomy, the use of virtual reality (VR) may be perfectly suited for application at the foramen of Monro. Using DICOM data from sub-millimeter slices of CT and MRI studies, VR can render the ventricular anatomy to pinpoint accuracy. With a few buttons, the hollow space of the foramen/ventricles can be turned into solid form, resembling a metal or wax cast of the last century. The modern VR software allows for investigation of any area of interest in any plane, but in addition to flexible rotation and gyrations (in yaw, pitch, and roll), it also provides the ability to slice through the relevant anatomic surroundings, just like CT/MRI, but once again, in any plane of choice. Using a virtual reality system, we studied the morphological and anatomic characteristics of the foramen of Monro in 30 living subjects without hydrocephalus. In these 15 men and 15 women, we recorded the size and shape of the foramen and analyzed the data statistically. The alterations of the foramen in hydrocephalus were then analyzed in 16 patients. Finally, we performed an anatomic study on 10 subjects with pineal tumors and concomitant hydrocephalus to investigate the displacement of the foramen during a hypothetical ETV and pineal tumor biopsy through a single burr hole. In this last part of the study, the virtual reality system was used to generate the anatomical models, place the trajectories to targets, and measure the anatomic results. Virtual reality served three purposes in this study: (1) to generate brain and ventricle models as subjects; (2) to generate trajectories to and from the tuber cinereum and pineal tumors; and (3) to measure distances as data of the study. For all three purposes, a Surgical Theater Surgical Planner (SRP) workstation running 64-bit Microsoft Windows 10 Pro (Intel® Core™ i7-5930K CPU 3.50 GHz, 3GB RAM) was utilized along with Surgical Theater proprietary technology version SRP 7.4.0. In accordance with US Food and Drug Administration requirements, the measurements made with the virtual reality system were validated through rigorous testing. The size of an object measured in VR was required to be within 1 mm of the physical size of the same object measured using calipers on a physical phantom. A comparison of the measurements showed that each was within the required specification (± 1 mm) for measurements in VR using both HTC Vive and Oculus Touch headsets. The VR databank at the George Washington University Hospital was searched for 30 living subjects (15M, 15F) without hydrocephalus and ventricular abnormalities. Once identified, the imaging study was immediately anonymized, and, except for gender and age, no demographic information of the subject was kept. Each study subject was then given a number for identification during the investigation. For patient with pineal tumors and concomitant hydrocephalus, patient registries from the University of Virginia, Georgetown University Hospital, Washington Hospital Center, Allegheny General Hospital, and George Washington University Hospital were searched. The inclusion criteria were (1) pineal tumor; (2) hydrocephalus; and (3) availability of a thin-cut “navigation-quality” MRI prior to interventions on the hydrocephalus. All patients with the first two, but thin-cut imaging study only after the placement of an external ventricular drain, were excluded. In the end, 10 appropriate patients were identified. Their imaging data was input into the VR system for generation of the study model. Furthermore, 6 other patients with hydrocephalus but without pineal tumors were used to study the foramen of Monro in the hydrocephalic form. In addition to observational data, measurements of the foramen were performed in three-dimensional space. Since the foramen has an oval shape, the diameters of the short and long axis were measured separately, at the narrowest point in the foramen, in a plane parallel to the opening. The area was then calculated using the formula A = D1/2 × D2/2 × π. To start the measurement, a preliminary ruler was implanted using the top-down view on the foramen (Fig. 1). This ruler was then examined for placement and accuracy in multiple angles in 3D space, with the ventricle and foramen first as empty spaces and then as a solid “cast.” Every foramen was measured in this fashion and data recorded only when confirmation of the correct and precise placement of the ruler was obtained (Fig. 1a–d). In the midline sagittal DICOM image, the anterior wall of the pineal tumor and tuber cinereum was highlighted. These “markers” were then transferred into the 3D virtual reality model. A trajectory was made connecting the anterior/inferior surface of the pineal tumor target to the center of the foramen of Monro, and this was extended to the surface of the skull. Since the procedures are universally performed through the non-dominant hemisphere, we only analyzed the trajectory through the foramen on the right side. Where this trajectory meets the skull was marked as “S1.” A second trajectory was made connecting the tuber cinereum and the center of the foramen of Monro. Again, this was extended to the skull surface; the exit point marked as “S2.” The midpoint between S1 and S2 was chosen as the single study entry site (SE) (Fig. 2a–c). Next, trajectories were made connecting the SE to (1) the pineal tumor target (T1) and (2) the tuber cinereum (T2). Three measurements were then taken: (1) the separation of T1 and T2 at the level of the center of the foramen of Monro; (2) the distance between T1 and the posterior margin of the foramen of Monro; and (3) the distance between T2 and the anterior margin of the foramen of Monro (column of the fornix) (Fig. 2d, e). Collected data were analyzed using the statistical analysis package on Microsoft Office: Excel®. χ2 test was used to determine the difference between two variables. Two-tailed t tests, both paired and unpaired, were utilized to analyze the difference in the mean between groups, with the p value of < 0.05 considered statistically significant. Correlation of variables was analyzed using the Pearson correlation coefficient, again with a p value of < 0.05 considered as statically significant. The foramen of Monro is a channel in the shape of a cylinder which flares out at both ends, and is narrowest in the middle. The shape resembles a “nuclear power plant” seen from afar. The opening is in a plane oblique to the axial, coronal, and sagittal planes; it slopes downwards from medial to lateral and from posterior to anterior. In other words, the long axis of the channel (which is perpendicular to the plane of the opening) is in line with the “perfectly placed” external ventricular drain. The vast majority of foramens we examined were oval in its opening. Viewing this opening top-down, perpendicular to a plane in-between the axial and coronal planes used for imaging studies, we recorded the orientation of the oval as “landscape” if its long axis is < 45° from the horizontal axis and “portrait” if it is < 45° from the vertical axis (Fig. 3). With this designation, 54 out of 60 (90%) of the foramens in patient without hydrocephalus were in the “portrait” orientation (χ2p < 0.005). At the narrow portion in the center of the channel, the opening of the foramen of Monro in people without hydrocephalus ranged from 0.43 to 24.1 mm2, with an average of 5.23 mm2 (n = 60) (Table 1). The median age of our study cohort was 55. In the younger half, the average size of the Foramen of Monro (both sides) was 3.28 mm2, and it was 7.19 mm2 in the older half (p = 0.007). (Table 1, Fig. 4) The left-sided foramen was larger than the right in 22 out of 30 (73%) study subjects, and the difference in the mean between left and right was 5.93 versus 4.52 mm2. A “paired” t test comparing the left and right yielded a p = 0.002 (Table 1, Fig. 4). The average size of the foramen in female subjects (both sides) is 5.0 mm2 (range 0.6–15.8, SE = 0.8), whereas the average for male subject is 5.47 mm2 (range 0.44–24.0, SE = 1.25). The difference did not reach statistical significance (p = 0.75) (Table 1, Fig. 4). For the purposes of this study, we defined “hydrocephalus” as ventriculomegaly with associated neurological clinical symptoms. Whereas the orientation of the foramen in normal subjects is “portrait” in the vast majority of normal subjects, only 9 of 32 (28%) of foramen in patients with hydrocephalus are in the “portrait” orientation (χ2p = 0.01). The majority, 72%, were in the “landscape” orientation in these patients. In the 16 patients included in this part of the study, the opening of foramen of Monro averaged 32.6 mm2 (range 8.63–62.8, SE = 2.54, n = 32). In 10 patients, the left side was larger than the right (63%), but the difference did not reach statistical significant on paired t test (Table 2). Because the cohort was small (n = 16), demographic information was insufficient to draw conclusions on the relationship between the foramen and gender or age. Using the methods described in the “Methods” section to place “ideal” trajectories for ETV and pineal tumor biopsy, the S2 site ideal for ETV was measured at an average of 8.7 mm posterior to the coronal suture and 19.6 mm right of midline. The SE was on average 24.6 mm anterior to the coronal suture (range 16–32; median 27.3 mm) and 20 mm lateral of midline (range 16–26; median 20 mm). We did not record the location of S1, ideal for the biopsy, because the position was on the forehead for all 10 subjects and would be cosmetically damaging if actually used. This site was used for calculation of the SE only. The distance between the trajectories to the pineal and tuber cinereum targets, as measured at the level at the center of the FoM, averaged 16.8 mm (range 11–22.4; median 16.5 mm). The “displacement” of the posterior margin of the foramen averaged 5.71 mm (range 1.1–9.3; median 5.4 mm). The displacement of the anterior margin of the foramen, which is the column of the fornix, averaged 5.76 mm (range 2.7–10.4; median 5.6 mm) (Table 3). Neither the posterior nor the anterior displacement correlated with the size of the FoM (posterior: r = 0.25, p = 0.47; anterior: r = 0.32, p = 0.36). Finally, while examining the relationship between tumor size and displacement, we found that correlation between tumor size and posterior displacement did not reach statistical significance, but there was a trend suggesting a correlation between small tumor size and more anterior displacement (p = 0.06) )Table 3). The discovery of the foramen connecting the lateral ventricles with the third ventricle is commonly attributed to Alexander Monro secundus (1733–1817). Although nearly two-and-a-half centuries have passed since its first description, there is scant information in the English literature on the microsurgical details of the foramen of Monro. In what we did find, the shape of the FoM was described as “crescent shaped,” indented anteriorly by the concave curve of the column of the fornix [11, 13]. Using our VR investigational methods, however, we found that the foramen is oval. Since the previous descriptions were made in cadaveric studies, and we are the first to report these findings in living subjects, the discrepancies may be explained by the effect of fixation or post-mortem changes. 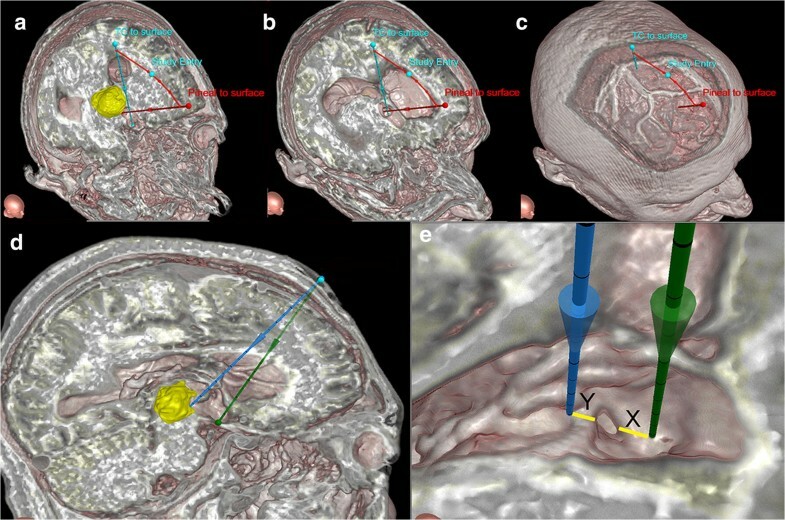 This point highlights the power of VR in anatomical studies: the position, shape, and configuration of the foramen cannot be accurately characterized on two-dimensional imaging modalities, but with VR, we can easily record all of that in three-dimensional, volumetric space, in living subjects. We were unable to find any previous data on the size of the normal foramen, except for one brief reference to a Chinese study which reported the average size to be 5.4 mm × 2.7 mm . The methods and other details of that study are unknown, but an oval opening with those dimensions would make the area 11.5 mm2. Contrastingly, using our methods of measuring the area in 3D volumetric space, the area averaged only 5.23 mm2. In the current study, the foramen in men was slightly larger than in women but the difference did not reach statistical significance. Curiously, the left foramen (in both genders) is larger than the right, and this difference was statistically significant in paired t test (p = 0.002). This finding is particularly interesting when placed in context of data which showed that the right hemisphere and right lateral ventricle are both larger than their counterpart on the left . Our data also showed that the FoM is larger in the subjects over age 55, which is in line with expectations given the cerebral atrophy with age. Anatomic and volumetric studies of the ventricles, although limited, have been described in the literature, but these tend to focus on patients with normal pressure hydrocephalus (NPH) . 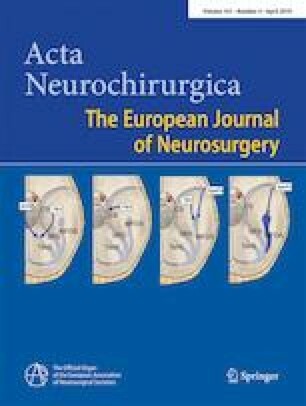 At present, there is no published report in the literature on the anatomy of the foramen of Monro in either cadaveric or live subjects with hydrocephalus. Using VR and studying in 3D volumetric space, we examined the anatomy and morphology of the FoM in patients with hydrocephalus. The most interesting finding was that the foramen changed in orientation from “portrait” in normal patients to “landscape” in patients with hydrocephalus, and this was found to be statistically significant (χ2p = 0.01). From an anatomic perspective, the foramen of Monro is bounded anteriorly by the junction of the column and body of the fornix and the anterior pole of the thalamus posteriorly. As the ventricles enlarge in the hydrocephalic patient, these structures presumably limit the directional change in the foramen leading to its “landscape” orientation. Finally, the opening of the foramen averaged 32.6 mm2 in patients with hydrocephalus, compared to 5.23 mm2 in normal subjects. Knaus et al. undertook a similar study but in 11 children . In this study, however, a so-called mean trajectory was used similar to the current investigation: “ideal” trajectories to each target were used to generate the location of the entry site geometrically, and this was then used for the simultaneous ETV and biopsy. These investigators also measured the foraminal displacement in two dimensions and reported an anterior displacement of 1.9 ± 2 mm and posterior displacement of 2.4 ± 4 mm. Since their cohort had a mean age of 11, it is difficult to generalize their data to adults. 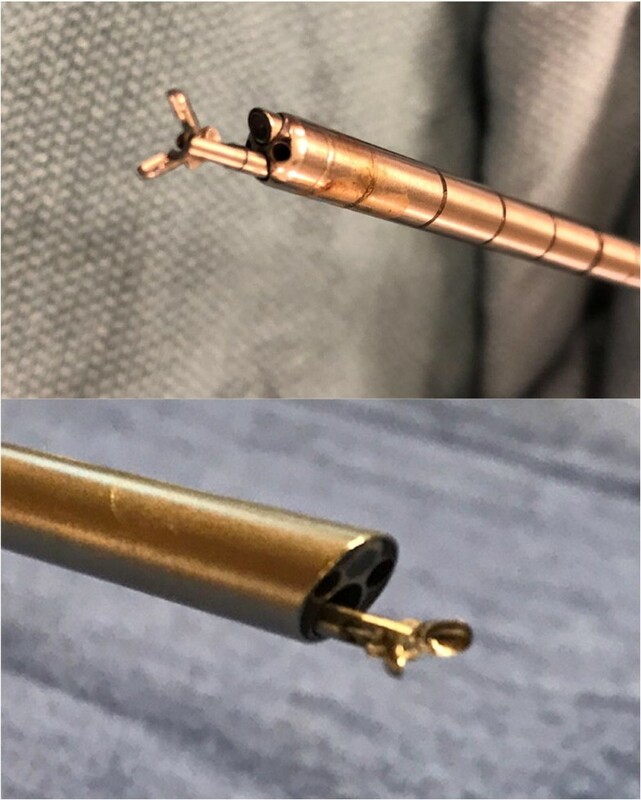 In both studies, it was unclear how the investigators chose their patients for the single burr hole procedure and whether they had other patients for whom they chose to use two entry sites. We eliminated this potential bias by making our investigation a purely anatomical one, and studying all patients with pineal tumor with concomitant hydrocephalus who fit the inclusion criteria, regardless of their clinical course. What we discovered was that, if uniformly performed with a single entry site, a simultaneous biopsy and ETV may distort the foramen of Monro as much as 9.3 mm posteriorly, and perhaps more concerning, displace the column of the fornix at the anterior margin of the FoM as much as 10.3 mm. One would have expected the displacements to increase with smaller FoM area and smaller tumors. Probably related to the small cohort size, we were unable to find any statistically significant correlation, but there was a trend suggesting a correlation between smaller tumor size and greater anterior displacement (p = 0.06). The main strength of the VR system in this study is in the clear delineation of the foramen of Monro in three-dimensional space, and when compared to two-dimensional modalities, it left much less doubt where the margins were located. We believe that this generates more accurate measurements. However, to render adequate anatomical details of the foramen of Monro, the virtual reality system required thin-cut, navigation-quality MRI scans, and our study design required these scans prior to intervention on the hydrocephalus in order to study the foramen in its “natural” form. Because of these requirements, a large number of patients with pineal tumors were disqualified from the study, as they presented emergently for hydrocephalus and obtained their pre-operative MRI only after placement of EVD. As a purely anatomical study, we kept no data on our study patients after their MRI was obtained. Whether they in fact underwent simultaneous biopsy and ETV with a single or two burr holes, diagnostic yield, subsequent craniotomy, and neuro-psychological results are all beyond the scope of this report. Again, because of the restricted inclusion criteria mentioned above, it was difficult to collect a cohort with enough similarity in those clinical characteristics to make solid conclusions. In the future, it would be fruitful to gather a large series to study all those variables in addition to anatomical ones. In addition to the foramen of Monro, the massa intermedia can often be an obstacle for reaching the pineal tumor target . In our study cohort of adults, we did not encounter anyone for whom this structure was a major hindrance. One assumption we made in setting up our study design is that the release of CSF on entrance into the ventricular system would not alter the size of the foramen of Monro significantly. If “brain shift” of this kind leads to reduction of the foramen size, then displacements of the margins would be even more significant than reported here. Another assumption is that both margins of the foramen were equally sensitive to displacement or distortion, and therefore we chose a study entry site that bisected the distance between the ideal entry sites for ETV and biopsy. This assumption might not be true. If we made a different assumption, that the fornix is twice as sensitive as the thalamus is to manipulation, for a future study, we might use an entry site that is closer to the ideal site for the ETV which would minimize the displacement of the fornix anteriorly, putting most of the stress of manipulation at the posterior margin of the foramen. The universal application of a single entry site for simultaneous ETV/pineal tumor biopsy with a rigid endoscope can lead to a distortion of the fornix up to 10 mm. We believe each patient should be assessed carefully before surgery, with the best visualization modality available to the surgeon, and if possible with VR in 3D volumetric renderings. This will help determine if the single entry site can be safely applied. In individuals where the displacement is above 5 mm, consideration should be given to use separate entry sites for the two procedures. Author AH-R is employed by Surgical Theater LLC as on-site senior clinical engineer for its VR system at George Washington University. All other authors certify that they have no affiliations with or involvement in any organization or entity with any financial interest (such as honoraria; educational grants; participation in speakers’ bureaus; membership, employment, consultancies, stock ownership, or other equity interest; and expert testimony or patent-licensing arrangements), or non-financial interest (such as personal or professional relationships, affiliations, knowledge or beliefs) in the subject matter or materials discussed in this manuscript. There were no procedures performed in studies involving human participants. As a retrospective study, patient data were identified for examination and thereafter, only the gender and age were kept. For this type of study, formal consent is not required. This is a very interesting and well-presented study on the emerging use of virtual reality to study surgical neuroanatomy, here specifically the foramen of Monro. This manuscript would be of interest to readers and illustrates a meaningful potential application of novel technology to surgical planning. The study is well-organized, with the methodology and limitations adequately described. If possible, a higher quality image for Figure 5 would improve the manuscript. Overall, the authors are congratulated for their work.